The weather in Pisa was not the best and the ground was very wet, so it was difficult to canter at full speed. Despite that, there were some violent lance breaks, and the audience obviously enjoyed the excitement. Pisa is a magical city, as are all historical cities, and the jousters were given great hospitality. 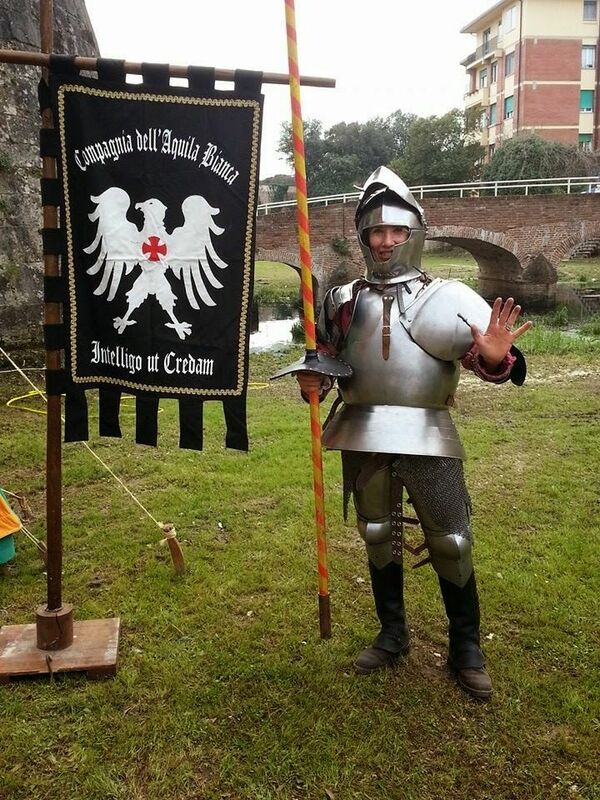 In addition to Roberto, there were two other jousters, Fulvio and Daniele, who showed great professionalism. Gianluigi, Enrico, Margherita and Simona(who I assume were the ground crew) provided a calming and motivational presence throughout the tournament. Roberto is very proud of the whole team. An official named Roberta Inama tried on Roberto's armour and commented on how difficult it must be to ride a horse wearing 30 lbs of steel. Many thanks to Roberto Cinquegrana for providing the information for this article.